Put simply a hashtag – or using a # in front of a word or phrase – is a way of making sure people with a particular interest can ‘see’ a tweet or a twitter conversation, even if they don’t follow that person on Twitter. On most twitter platforms you can search for a hashtag (try putting #physiotalk into the search function and see what results you get) or on applications like Tweetdeck and Hootsuite you can permanently follow a hashtag that is of interest to you. 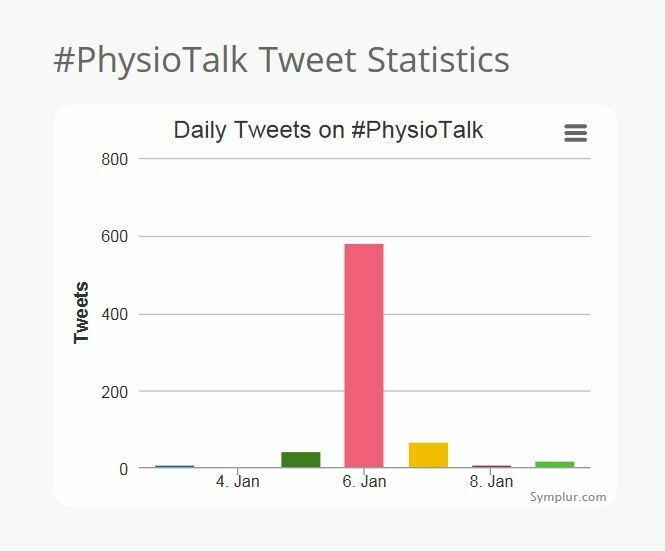 I use Tweetdeck and one of my columns is set to #physiotalk so that I can instantly see what has been tweeted using the hashtag and it’s great for 8pm on a Monday night as well! (If you use a hashtag you have to make sure whatever you put after the # is all one word – so putting #physio talk would actually only search for people using #physio). So – we all know about #physiotalk but how do you get to know about other hashtags? Luckily there is an answer – go to www.symplur.com, the Healthcare hashtag project. There you can search for hashtags by disease, conference specific or of course Tweetchats! There is an online calendar of Tweetchats you can easily see what is on and when! You can also see popular hashtags and what is ‘trending’. 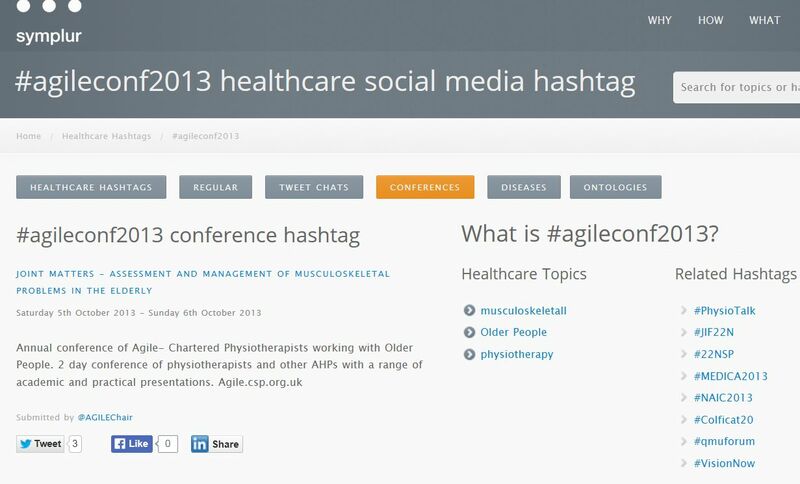 I first came across Symplur when AGILE wanted to set up a hashtag for our 2013 conference. After choosing a suitable hashtag it is simple to register it on the website together with the dates of conference, so that anybody can look at the conference calendar and know to follow hashtags that are of interest to them. What is great is that Symplur will then allow you to see a live stream of tweets using the hashtag, to download a transcript of all the tweets using the hashtag at any stage and to see analytics – how many tweets, when, who and the impressions (that is tweets x followers) to see your ‘reach’ into Twitter. When starting the planning for #physiotalk one of the first things we did was to register the hashtag. For a Tweetchat there is a little more checking by the Symplur team to see that it is unique and also being ‘used’ but once it is approved then it quickly goes into their Tweetchat calendar with information about the Tweetchat and how often it will take place. As with conference hashtags, at any time there is a wealth of analytics anyone can access, and of course the ability to save a chat transcript – essential after a busy chat to review what everyone has said, and also a great way of saving the information for your CPD (I either link directly to my Pebblepad account or print into a pdf for saving). To access #physiotalk information just go to the http://www.symplur.com/healthcare-hashtags/physiotalk/ . You can then scroll down the page to access the transcript and analytics function – just remember as the website is USA based that timings will not be GMT! (It is generally 8 hours behind…) You can put in a time period that interests you – press the button and all the information is displayed! So why not give it a go – use Symplur to download transcripts for your CPD if you have taken part in a Tweetchat, search for relevant chats or conference hashtags and follow them to make your use of Twitter more personal to your interests and speciality. A final thought – It would be great if more physio based groups such as Professional or Regional networks registered hashtags so they could be easily searchable via Symplur – so that everyone could follow them at a conference or during a special event?